Say it isn’t so. Another failed government agricultural project. When will they learn? Can we the citizens make a constitutional amendment that would ban the Government of Jamaica from agricultural endeavours using taxpayers’ money or borrowed money? You have to read the nonsense that has been unearthed in this article below by Ingrid Brown from today’s Jamaica Observer. MISMANAGEMENT by the Agro Invest Corporation (AIC) has resulted in the loss of a projected $50 million worth of onions at the Plantain Garden River (PGR) Agro-Park in St Thomas, which is among those touted to produce Jamaica out of debt under the International Monetary Fund (IMF) agreement. AIC is Government’s project management and execution agency responsible for certain deliverables in all agro-parks across the island. Further, the more than 40 farmers involved in the onion project at PGR are on the brink of throwing in the towel after a raw deal left them each owing $300,000 in loans to the St Thomas Co-operative Credit Union, despite AIC being responsible for the loss of the crop. 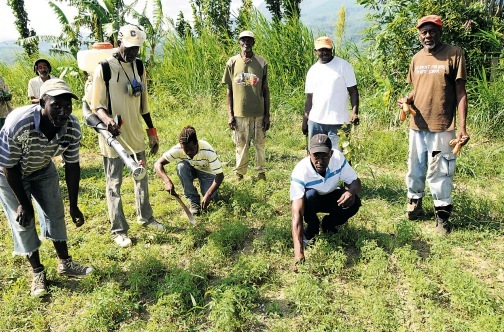 The Jamaica Observer obtained a copy of a status investigative report compiled by the Rural Agricultural Development Agency (RADA) which confirmed the farmers’ claims that they were misled by AIC, which failed to provide the irrigation system in a timely manner despite $100,000 of the $300,000 loan being allocated for it. The farmers told the Observer that they objected to an overhead irrigation system as they didn’t believe this was suitable for crops, given the soil type, but their concern was ignored. However, the status report made it clear that overhead irrigation should have been avoided. “Fields at PGR are irrigated using sprinkler system; this will only assist in spreading the disease,” the report confirmed. “Decision by the project management to plant onion seeds prior to the installation of in-field irrigation impacted significantly germination rates and proper development of plants,” the report stated. The report further stated that “pre-emergent herbicides were applied under less than ideal conditions against the advice of stakeholder agencies, rendering it largely ineffective”. One fertiliser application was said to have been made where three would have been required. And although project management committed to making small tools and equipment critical to onion crop production available, none was delivered to the farmers. “As early as June 2013, approximately three weeks after planting, RADA made recommendations that included the re-planting of poorly germinated plots after in-field irrigation of plots were completed. Crop was affected by slow response to pest pressure, because equipment and agricultural chemicals that were to be in place by the Agro-Park project management was absent. “Momentum of farmer engagement into intensive onion production and trust of the management of the project might be compromised,” the report said. It noted further that farmers at PGR will realise significant losses in production and, by extension, revenue. “All the farmers benefited from loans through the Credit Union Inter-American Development Bank facility and as such will end up owing significant sums without the means to repay,” the report stated. “In order to qualify for the credit union loans, each farmer was required to provide $30,000 as surety and this has been frozen until they can afford to repay what is owed. “It is so unfair, because we trusted in this project because of how it was sold to us, and many farmers had to sell what they owned and others borrowed what they could to come up with the $30,000. And to think that after months of bending our backs in the onion [field], not one cent has come into our hands and we have nothing to show for it,” one very despondent farmer told the Observer. The farmers explained that the idea of the agro-park which was sold to them is that each farmer would reap an average 25,000 pounds of onions on the lower end and a maximum of 40,000 pounds. The minimum production, they were assured, would not be less than 10,000 pounds in a worst-case scenario. They were informed that they would receive $50 per pound for the onion and this would be enough to service their loan and turn a profit. But, according to the farmers, they were only able to recoup $800,000 worth of the onions, and that was paid directly to the credit union to service the loan. “Some farmers get hit so bad that only nine or 10 farmers got a little onion to sell amounting to $800,000 and so we all agreed to the freezing of that money so it could service the interest of all of us,” another farmer explained. This entry was posted in Agriculture, Articles/Columns from Jamaican newspapers, Economics, Jamaican Issues and tagged Agri-Parks Jamaica, Jamaican Agriculture, Jamaican Ministry of Agriculture, RADA, Roger Clarke. Bookmark the permalink.